It might be a truism to repeated it again and again, but leadership is closely related to productivity and effectiveness. The one cannot exist (or co-existed) or function without the other! Whatever the leadership style may you employ to lead your life and business, whatever infrastructure or organization you have in place, you cannot be truly successful before you learn to integrate your productivity schemes in your leadership style. You cannot be a successful piano player before you learn the basic keys on the piano and how to use them to produce “music“. At first, it is difficult (as any discipline is) but later on, it becomes easier and you learn instinctively what to do in order to produce something is “palpable” to an audience. 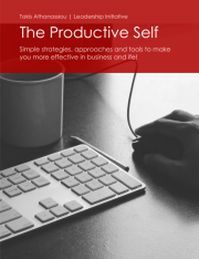 Personal productivity is an important asset for any leader! As it is driving. First, you have to think all the different pedals, gears, movements you have to do in order the car is moved, but you are starting actually to drive when all these are managed unconsciously and your focus is towards your direction and on the road. via GIPHYIt is the same thing with leadership. Exactly. A leader cannot be truly effective if he/she cannot arrange his/her life and business in a way which would permit him/her to have time for visioning, planning and executing on his/her vision. Time, of course, is just the one parameter of the leadership productivity equation. Time and energy management are constants (or should be) in his/her workflow. The other part is the organization and knowing what are his/her objectives in life and what is his/her mission. The “white whale” of productivity consists of many components. Especially so, when you want to have a system in place to support your leadership initiatives (these, of course, include both the formal leadership escapades you might involve into as your goals and activities to lead effectively your life and business). 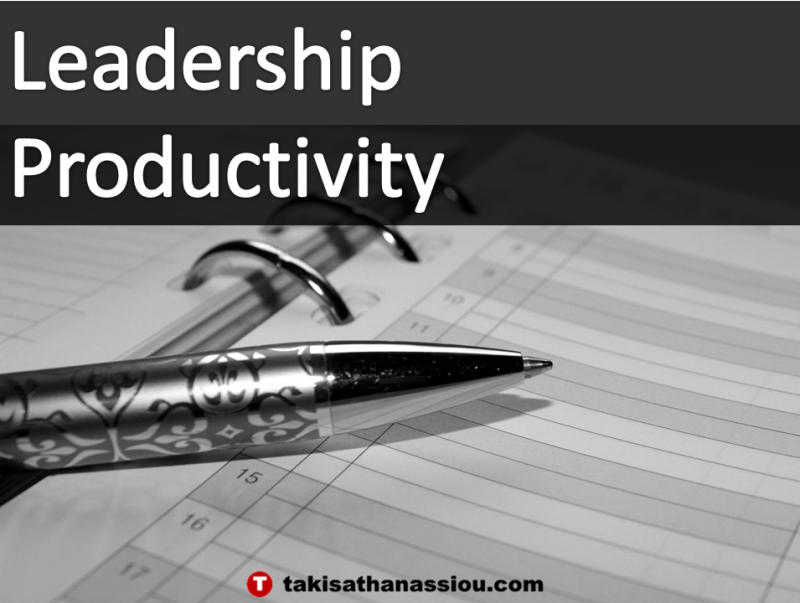 What productivity have to do with leadership? Yes, productivity relates to many of these components, but at the end of the day, nothing of this is important if you do not have the infrastructure to support your next moves and promotes you a bit closer to your goals. How to be important if my vision is to help the people around me to find their true help if I could not define my strategies and my ways on how to do that and multiply it many times over. Or how I would be ready to save myself from a business problem or crisis if I had not designed and documented the operations I can follow step-by-step to save the day (and of course I had not designed them in a more “cool” way, outside from the “hit of the moment”). As a consultant I work in many different environments, with different people and applications, trying to help them do more efficient their work. I use much application either because of my clients, insist on using something, or just because I have certain working mannerisms (developed over a long time period and help me to various situations) like my note-taking habits in analog media, which I’d like to keep on use. 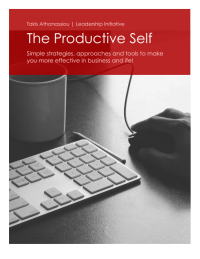 Extended productivity schemes can be utilized for many aspects of life and business! I consider myself as an overachiever and I want to have “tangible” results in my life and work because this permits me to develop certain energy and time margins to do other things (like exercising, sketching, reading, meditating, etc.) and keep a life-work balance. At the end of the day, though you know that you have to relay to a small sub-set of approaches and tools which will support your activities and efforts in the long run. For me, this “trust” is the result of a selection process which helps me to filter out applications and tools does not fit my workflow and working life and keep the things I find of importance. to mention just a few of their major features. among many other similar services. For online file storage, I use the Google Drive, the Dropbox, and the OneDrive (for different purposes of course). A core component in my organization plays the Dropbox while, many times I find myself do a lot of work in Google Drive. In any case, my main service is Dropbox and I use it daily. For this reason, I have searched and developed a file organization scheme can help me focus on what’s important and support both my personal as business operations. The result, of this operation, The file organization system I have developed, and I will present it in the next chapter, can work in any such service without modifications (it is neutral in its implementation). For clarity purpose, I will use the Dropbox as my main repository. 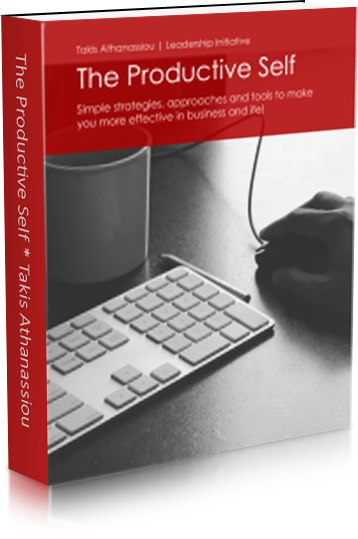 Dropbox is an excellent tool can help you organize more effectively your life and business. I use it for many different purposes and operation and not just for storing files. All these requirements are well served by Dropbox (and so much more, actually). For this reason, I have developed a flexible file system in the Dropbox to help me focus on the important aspects of my life and work. 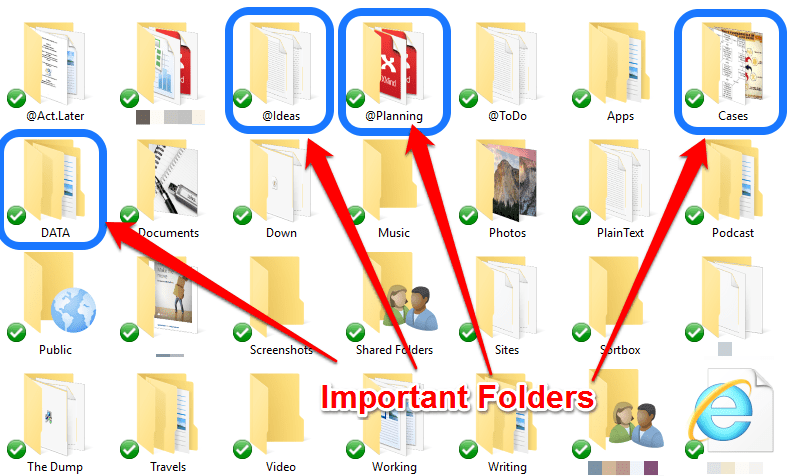 For the development of my system, I find particularly useful the following reference, which exemplifies by far the operations and the folders I should have in my Dropbox Folder and provide various cases of usage, to help me decide what would be important for my operations. I use these articles and case as the base of my system, which later I expand it to fit my requirements. Over the time, this system has grown organically by my new additional requirements as my needs and operations expanded. In its today form (and this is not final, of course) consists of a number of folders which host the respectful files. I usually I am in the habit to store any new file in its corresponding directory, but when I have not timed for this, I have scheduled in my calendar some time (usually on Friday afternoon or Sunday just before my Weekly Review) to re-establish the order in my Dropbox, de-clutter the files, move or remove temp files, and, in general, tied the things up. I try, whenever possible, to use text files for tasks, to-dos, etc. in order to achieve the maximum compatibility across the computing environments I use. If I need a different application, I can extract the necessary information from my text file and add it to that application. If I use something more specific, I can always store the file in my Dropbox and check how to utilize it later on. Furthermore and following the general principles of GTD methodology I use Action folder (denoted with the initial @ and are flexible structures for temporary files and notes to be moved after their process to the filling folders) and Reference folders (permanent folders for the files I’m like to have online). @Act.Later: Action folder containing mostly text files (notepad in the rescue for Windows or TextEdit for Mac) with items, to-dos, and activities to be considered later on. This is an idea incubation folder for things I like to do, but I have not the time now. @Ideas: An Action folder I store all my ideas and things I want to work on. @Planning: Plans, schemes, visions, draws and everything I’d like to focus on. In this folder, I keep my life plans documents to review them frequently. @ToDo: All my action and to-do lists (mostly in text files). Apps: A folder stored all the data from the applications connected to Dropbox. Cases: A central storage place for files related to business cases, things I like to study further, points of interest, etc. This folder can act as a central swipe files repository for reference and working purposes. Data: One of my most important directories. In this folder, I store data from applications and tools can operate in different operation environments and can share a common storage place. Here you would find files as my text expander files (I use various applications for text expanding, here I store their data), bookmarks, Google services data, sync/backup scripts, etc. The Dump: A central place for all the files are not categorized yet or do not fit any existing category. Usually is the first thing needs organization and clearing up. Writing: Every text, document, and note related to things I want to right on, etc. Core documents: Basic documents you should keep available on your computer. Of course, there are more specialized approaches for that, but I think that it is important to have some documents always in handy (more information and relevant operations you can find here, here, here). HR: Documents related to your associates, new hires, etc. any other specific to your needs folder. Question: What is the structure of your files? How do you stay productive? How do you implement your ideal folder structure and where? You can leave your comments or your questions, by clicking here.